Want to see if the perfect toll free number is available for your business? You’ve come to the right place. Here at UniTel Voice, you can get a toll free number in just seconds. Our custom vanity search tool allows you to search for available 800 numbers by word, phrase, or number combination. Our search to has an API with the FCC’s national toll-free registry. This is the database of all available toll free numbers that are not currently “in use” or “owned” by other businesses. If you can’t find the 800 numbers you’re looking for, our search tool will automatically find closely related toll free numbers that are available. And if you’re still having trouble – our support team would be happy to help you come up with vanity number ideas and do the searching for you at no cost and no obligation to buy. 1. Think brand, industry or value proposition. 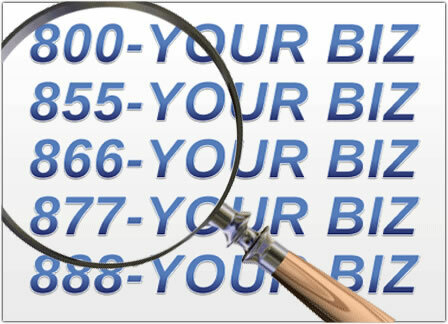 When it comes to picking a good 800 number for your business you want it to spell one of three things about your business: 1) Your brand name or a close variation (example: 1-800-Xfinity); 2) A word related to your industry (example: 1-800-ROOFING); and finally, 3) A word related to the value you provide customers (example: 1-800-LOWCOST). 2. Consider an alternative toll free prefix. Unfortunately, you’re going to find out that there aren’t that many true 800 numbers available. The reason is simple. Toll free numbers with older prefixes like 800, 888, 877, and 866 have been around longer so more of them have been purchased by someone else. The good news is the FCC refills the pool of available toll free numbers whenever it gets low by releasing a new toll free number prefix. The FCC authorizes the release of a new toll free prefix every few years, as they recently did with 833 toll free numbers. If you can’t find the 800 number you’re looking for, try toll free numbers with different prefixes like 888, 877, 866, 855, 844, and 833. The newer the prefix, the more options available. Even if the perfect 800 number isn’t available, you have a great shot at finding that custom number in 855, 844 and the newest toll free number to be released – 833. Follow us on social media to find out the second 822 numbers are released. 3. Buy more than one toll free number. There are two great reasons to buy multiple vanity numbers: 1) You can A/B test a custom 800 number’s performance by running both numbers in different ads and seeing which one converts better. UniTel Voice’s 800 number service is a really affordable way to do this with our call tracking features. And 2), you might consider getting a unique toll free number for each marketing channel you use (website, Google search ads, radio, billboard, newspaper, etc.) so you can track ROI (i.e., how much call volume is coming in on each number). That way you know where to spend your ad dollars. 4. It’s hard to find available 800 numbers. Why? Two primary reasons. True 800 numbers were first released in the 1960s so almost all of them have been snapped up by existing businesses. The second reason is some companies practiced grabbing up as many 800 numbers to profit of the misdialed caller traffic. It was reported that a few adult entertainment companies utilized this practice as well… We have no idea if this was a successful scheme for these companies, but it definitely drained the spare pool of available 800 numbers. 5. Just because an 800 number is disconnected – that doesn’t mean it’s not in use. Ever come up with the perfect vanity 800 number idea, and just decide to give the number a call? You might get excited when you hear a disconnected message. Unfortunately, just because the number is disconnected, doesn’t mean that the number is not in use. If the number was truly not in use, the number would return to the FCC’s spare pool and you might have a shot of getting it. But, it’s likely that the number still technically “in use” and owned by an existing company that is simply forwarding the number to a DID (landline local number) that is no longer in service. And the worst part, you have no way of figuring out who owns the number. Even if you track down the RespOrg (the phone company that services the 800 number) they can’t give you their customer’s information. They can’t even tell you who the customer is. The moral of the story is if an 800 number is disconnected – don’t get your hopes up – because that doesn’t mean it’s available or attainable.